Project “Madeira” is a business management solution for small and mid-sized organizations that automates and streamlines business processes and helps you manage your business. Signing up is easy, and you can migrate existing business data from your legacy system. When you have signed up for the Project “Madeira” preview, you have access to a demonstration company. The demonstation company contains sample data, but you can create your own sales documents, for example, or set up a bank account. 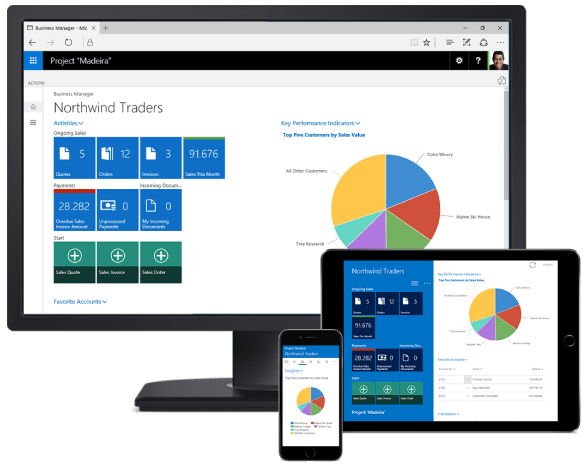 Microsoft is reinventing business productivity with Project “Madeira.” Start the preview to see how easy it is to connect business processes with familiar Microsoft productivity tools to grow sales, manage finances, and streamline your operations—in the office, or on the go. Project “Madeira” offers an embedded experience within Office 365 so you can create customers, vendors, quotes, and invoices without leaving Outlook. Export data to Excel for analyzing and create your outgoing documents in Word. When you’re on the go, take your finance and accounting tools with you. Desktop, tablet, phone—it’s a consistent experience, tailored to the device. Shorten the path from lead to cash when you can create new opportunities, control leads, and maintain visibility all the way through to payment—even on the go. Connect the moving parts of your supply chain, make informed decisions, better manage inventory, and control costs. 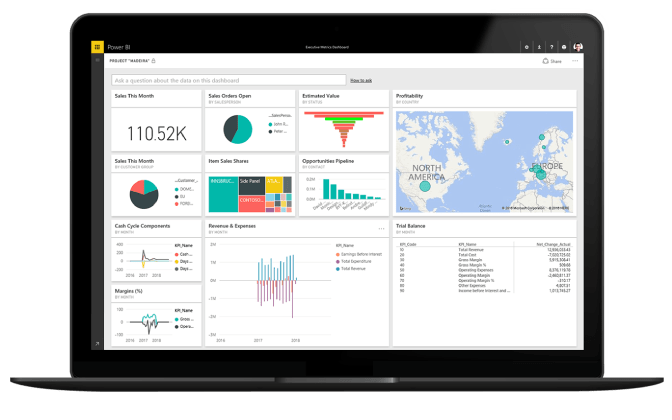 Project “Madeira” works with Power BI to create interactive reports based on operational data. Easily spot trends, stay current, and drive your business forward.